After completing The Thin Red Line (1998), filmmaker Terrence Malick began working on a film about Che Guevara and his failed revolution in Bolivia (that was eventually made by Steven Soderbergh) but after financing fell through he was offered The New World (2005), an account of the founding of the Jamestown, Virginia settlement and the relationship between Captain John Smith (Farrell) and Pocahontas (Kilcher), and, later, her relationship with Englishman John Rolfe (Bale). This story is filtered through Malick’s unique vision and results in a more Expressionistic, philosophical take on the material. The Native American Indian’s Eden-esque existence in 1607 is shattered when Chief Powhatan (Schellenberg) and his tribe witness the arrival of three British ships intent on founding a colony in the New World. We see the colonists – led by Captain Christopher Newport (Plummer) cautiously walk through a beautiful field of tall, lush green grass. He pardons Smith from being hanged for making mutinous remarks and he, in turn, helps establish the colony. They soon make contact with the local natives and both groups tentatively check each other out. It is at this time that Smith spots Pocahontas in the tall grass and they are fascinated by each other’s exotic looks. It doesn’t take long for the colonists to offend the natives and are beset by disease and other problems. Smith is ordered to make contact with Powhatan and develops a relationship with Pocahontas. 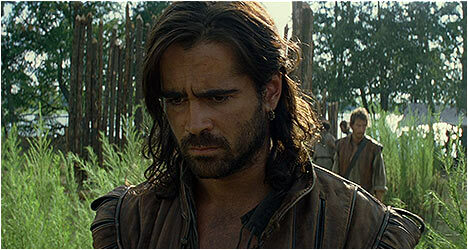 Colin Farrell portrays Smith as an enigmatic figure and Malick limits most of his dialogue to voiceovers consisting of his thoughts, which makes sense because of the obvious language barrier between him and the natives. As a result, Farrell relies on his body language and facial expressions to convey Smith’s feelings. Q’orianka Kilcher also relies on her body language to communicate and it takes a special skill to do this without looking ridiculous. Both actors rise to the challenge. As one would expect from a Malick film it is beautifully shot as he immerses us in the 1600s with an incredible attention to period detail but without being a slave to it. He is fascinated by Native American Indian culture and delves deep into the depiction of their way of life. As he did with The Thin Red Line, the filmmaker doesn’t present a standard historical biopic but rather an abstract, intimate take from the point-of-view of key figures, namely Smith, Pocahontas and Rolfe. Ultimately, The New World is Pocahontas’s story and how she goes from a simple life in the New World to life in Europe, a stranger in a strange land. This was the last Malick film to feature any semblance of a linear narrative, which he gradually moved away from over the years until The Tree of Life (2011), which saw a significant shift in how he told stories. A 150-minute version was shown to critics for awards season consideration in December 2005. When the film went into wide release in January 2006, Malick had recut it to 135-minutes with new footage and altering some of the voiceovers. When it was released on home video in 2008, a new 172-minute Extended Cut was released featuring even more new footage. All three versions have been included in this set. Of the three versions that exist in this set, the Extended Cut has the best transfer with the lush greens and earth tones looking the most vibrant and realistic. Ported over from the DVD is a ten-part, 80-minute making of documentary that takes a detailed look at the various aspects of the film. There are new interviews with actors Colin Farrell and Q’orianka Kilcher who talk about working with Malick, his unique approach and how it impacted their respective performances. Some really wonderful anecdotes are recounted on this extra. Also included are teaser and theatrical trailers. There are new interviews with producer Sarah Green, production designer Jack Fisk, and costume designer Jacqueline West as they talk about their respective contributions on the film and working with Malick. Editors Hank Corwin, Saar Klein and Mark Yoshikawa talk about the monumental task of shaping Malick’s film from all the footage he shot. It wasn’t easy and the director challenged them to match his drive for authenticity. Finally, Yoshikawa also talks about the differences between each cut and how they structure of the film evolved.